I took a picture to show how far snow flies off the township snowplow blade. That’s what I wish my little ATV plow blade could do. That’s not possible now that the banks on either side of our driveway are taller than the blade can throw. Guess I should have gotten that snowblower after all. In the distance, you can see the darker snow rubble swath is wider than the road itself. In the foreground, you can see how the trees have been plastered by the spray of snow. The energy of that flying snow is what pops our mailbox off its base every time the amount of snow is significant. Looking again at that photo taken last Friday, it is surprising how different our landscape now looks. Today we have at least twice the depth of snow compared to when that picture was taken. When I opened the garage to leave yesterday morning, we had only received a mere 3 or 4 more inches of light powder overnight. It made for a pretty tense early part of my commute though, because traffic was kicking up the unplowed powder into vision-blocking chaos before I reached the interstate. At one point, I had to slow to a stop, desperately hoping I wouldn’t get rear-ended by another vehicle before the view cleared up. 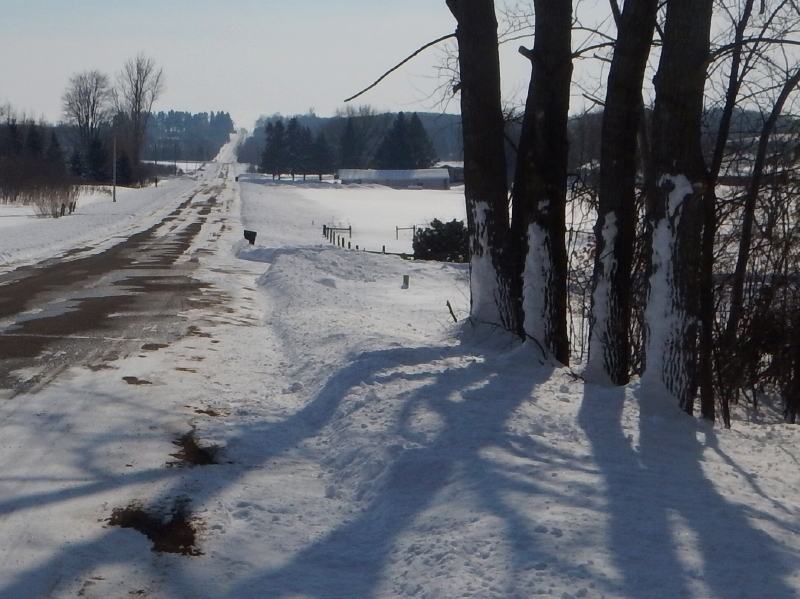 By the time of my drive home from work, the late-February sun was shining through and making a significant contribution toward clearing snow off the roadways. Our record-setting February snow totals conclude today. The weather service is predicting March will start out where February left off. We are supposed to get “plowable” amounts of snow tomorrow. How smart are dogs? Ours picked up on my activity right away when I got home from work yesterday. Sure, I dropped a few verbal hints that Momma was coming home, but I think she could tell by the way I was putting furniture back in place and converting my temporary man-cave back to our shared living space. Cyndie has actually returned a day earlier than her original plan, due to the winter storm that is expected to be in full swing this afternoon, around the time her flight was supposed to arrive. She moved it up 24 hours and arrived without hassle last night, making the drive from the cities on dry pavement. At one point last night, I found Delilah standing with her nose up against the door to the garage, clearly expecting it to open any minute. Maybe she heard something. I don’t know about that, but Cyndie was still over an hour away at that point. It was a pretty fun reunion when Cyndie stepped in the door. Delilah was incredibly happy, almost as much as Cyndie. We have had enough warmth recently to melt most of the snow off our driveway. I took a picture to use as a comparison to what it will look like after the 8-12 inches of predicted new snow stops falling. I’m going to stay at work as long as possible today, hoping to head home before snow accumulation begins to create traffic backups. Unfortunately, they have moved up the time that precipitation is expected to start to 9 a.m. today, so driving could be impacted long before the afternoon rush hour. If the depth of snow and strong winds lives up to what is being forecast, there is a strong possibility that I will stay home from work on Wednesday. All these possibilities are a lot less stressful for me now that Cyndie is home. I think Delilah feels the same way. It turned out that my concerns were unwarranted yesterday about even more rain falling on our already saturated grounds. From my repeated checks of the radar all day, it looked like a wall was keeping the surging mass of precipitation from moving north past a certain point. As it reached the southern boundary of our county, it stopped its advance and just seemed to slide past us to the northeast. This doesn’t mean that we dried out any. On the contrary. The sky remained heavily overcast and the dew point high enough that wetness continued to be the order of the day. It was a good day to have the warm glow of a fire in our fireplace! 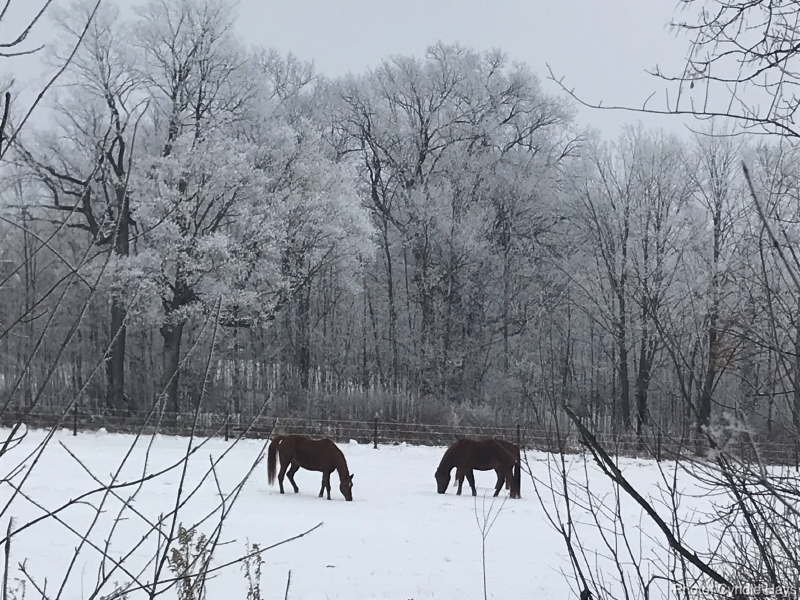 Happily, the lack of actual falling rain was a break for our horses, allowing them to avoid the cold soaking that rain in December involves. The bleakness of our landscape lingers on. According to forecasts, the next possibility for freezing temperatures comes at the end of this week. Even if it doesn’t bring a dose of accumulating snow, I will be happy to at least have the wet ground turn frozen, to give us a break from the frustrating mud. 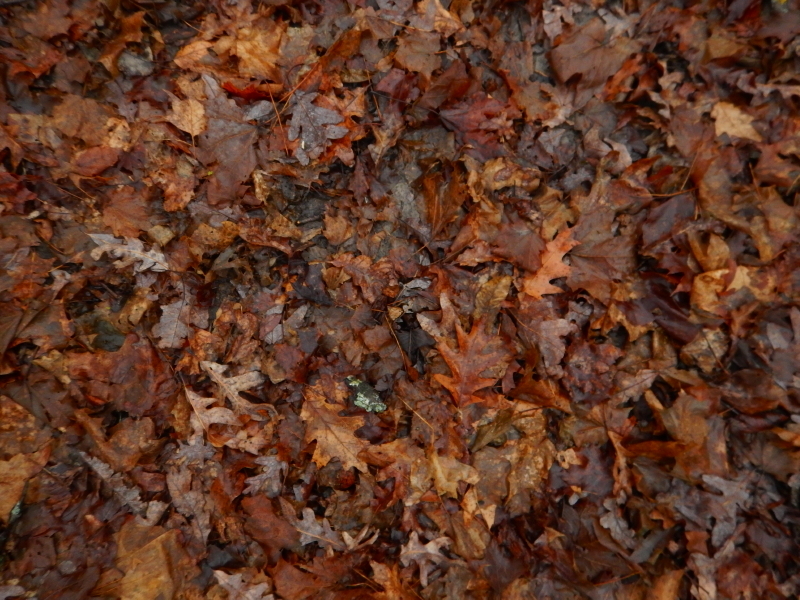 I’m pretty certain that frozen leaves will provide less hazardous footing than the wet leaves over slippery mud which we are currently enduring. The predictions for our weather being significantly stormy today have continued to intensify. Meteorologists report that all computer models remain in agreement for a potential of over a foot of snow in our region by Tuesday. Cyndie and I are ready. 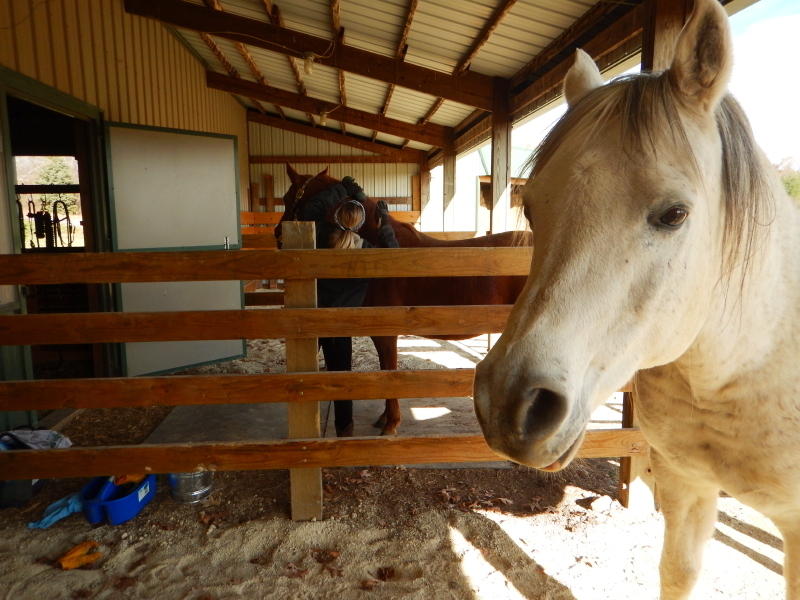 We say, “Bring it on!” I haven’t asked the horses what they think about it. We worked hard yesterday to tackle everything within our power that needed to be addressed before a lot of snow covers it all up. As we went along, we found little things to add to our list of preparations. It’s quite possible that I have never been as ready for a first significant snowfall of the season as I am today. 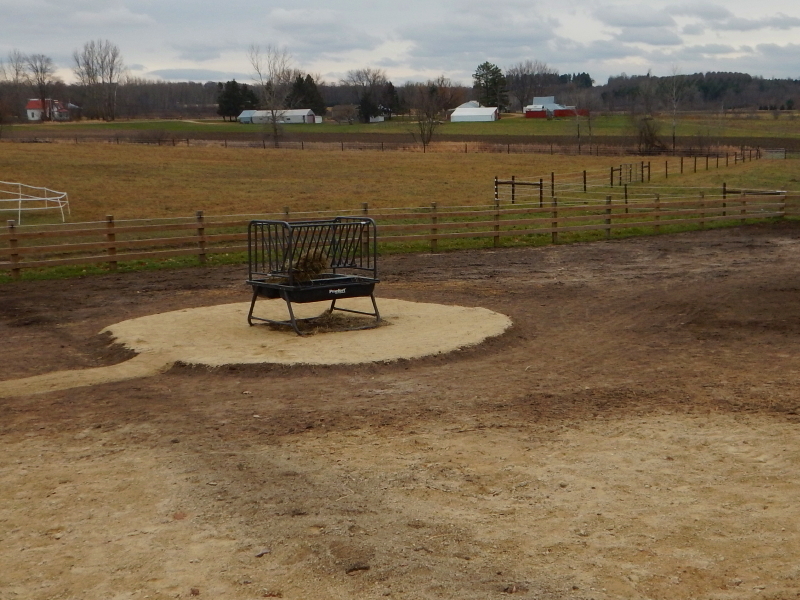 With Cyndie’s help, despite an ailing arthritic hip, I finished making a raised area around the hay feeder in the paddock. That also means we were able to use up the left-over pile of lime screenings. We rearranged equipment in the shop garage to move plow blades and snow tires to the front for easy access, and piled lawn care accessories out of the way in back. I went so far as to clean out leaves that had collected in nooks and crannies around the house and shop walkways where I will soon be trying to shovel snow. We re-hung tarps on the walls of Delilah’s kennel to give her added shelter. She was thrilled to be present while we worked, chasing mice that popped out when Cyndie disturbed a nest while sweeping out the corners. Yesterday morning I was teasing Cyndie with a query about whether we had enough toilet paper to survive the coming storm, since that is a common item that gets purchased when harsh weather is approaching. She assured me we did, but later in the day, as we rearranged vehicles to get the truck parked under a roof, she decided to make a run to fill the gas tank and pick up some groceries. She brought home more toilet paper. 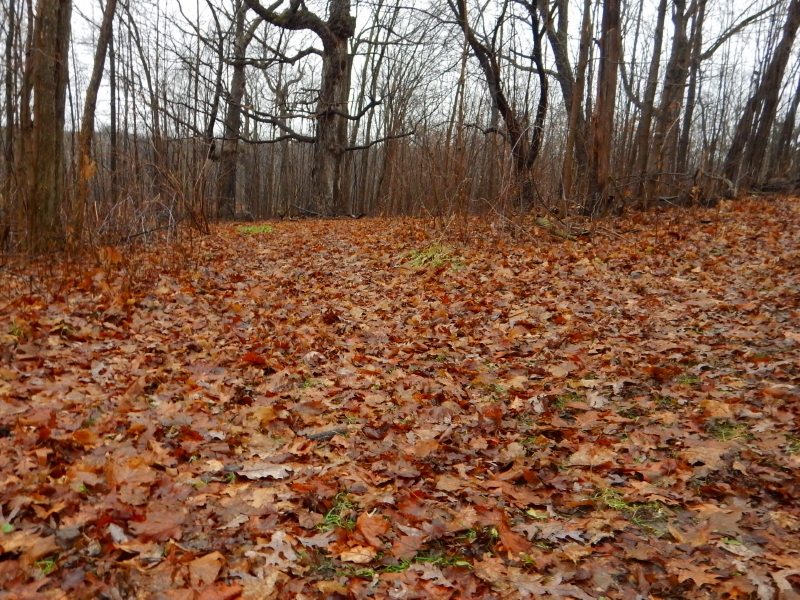 All that is left to do is let nature take its course and invite winter over to make itself comfortable at Wintervale. Seems like the picture above will be the last glimpse of dry ground we’ll see for a few months. Bring it on, we say. We think we are ready. 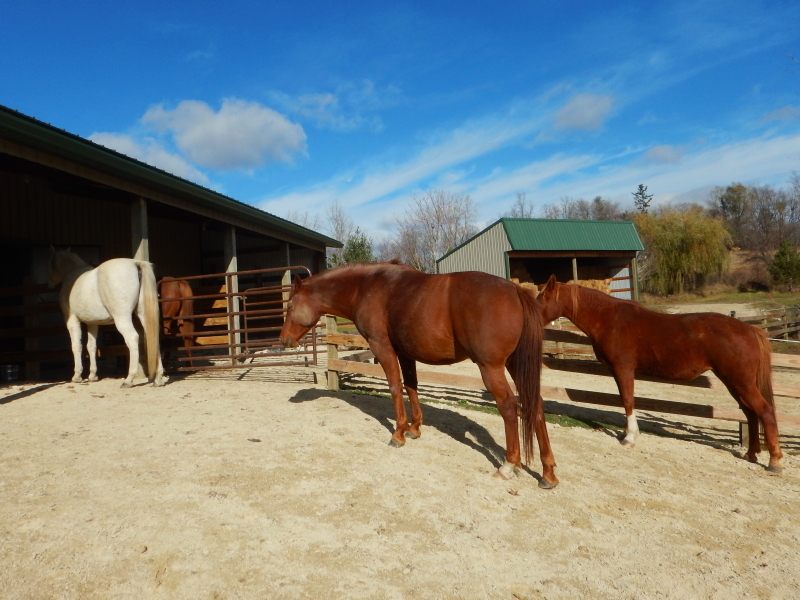 The horses were long overdue for some serious grooming, and yesterday Cyndie was able to give each of the 4 of them a thorough cleaning. Of course, this morning a couple of them have already found ways to grind in some new dirt. Apparently, they won’t have a chance to roll in dirt tomorrow, because the ground will be covered with snow. Weather forecasters have updated their prediction to a high likelihood of a significant snowfall event tomorrow. Looking at the weather this morning, I don’t get any inkling of the impending mayhem. It brings to mind the deadly storm that occurred on Nov. 11, 1940, the Armistice Day Blizzard. Thank goodness for the improvements in weather forecasting that have evolved since that time. If you want to see some in-depth detail of what is being forecast (as of 10:14 p.m. last night) for our region tomorrow, check out this post on my favorite weather blog, Updraft, from MPR news. It paints a pretty dramatic picture of what to expect. As I toiled away on my projects yesterday, moving dirt and pea gravel around the paddocks, Cyndie focused her attention on the horses. It was a treat to see how much they seemed to relish the attention. It was so calm and quiet I almost burst with appreciation for the pleasantness of the moment. Delilah was restrained on a leash nearby, and when she started barking for attention, I moved her closer to the action. That seemed to satisfy her needs and she laid down in the mid-day sun to regally observe the activity. 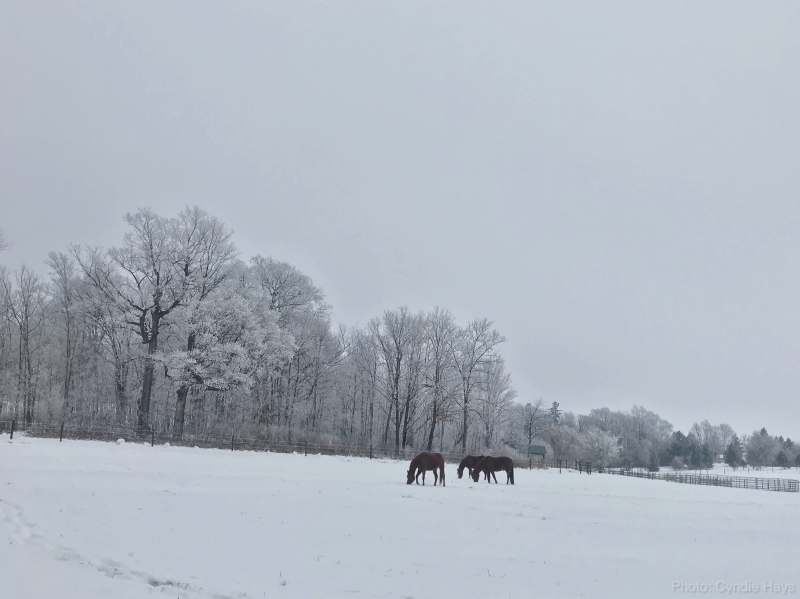 The horses alternated between lining up for the grooming appointment and strolling down to graze along the fence outside the paddock or out on the hay-field hill. Most of all, it was blessedly quiet. The air was filled with contentment, …a striking contrast to what is predicted to befall our little paradise tomorrow. Now I need to go batten down some hatches. There’s a storm a comin’!